Breakfast is a fabulous meal; often overlooked and often shunned at after about noon. This I don't agree with. What's wrong with a green chili smothered burrito at 2am? Or a little mint frittata for dinner? This one could take a few minutes to put together - if you're going to make the biscuits from scratch. It takes me about half an hour to mix up biscuits and bake them. You could also buy those can ones- you know, the paper canister that POPs open. 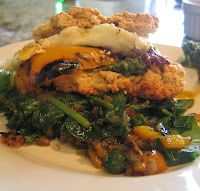 In the photo, I served this atop the spinach and yellow pepper salad, which is more of a brunch item, but it's good. Make the breakfast sandwich day or night, eat it with a fork and knife, fat and happy you'll be - with an egg in your belly. It is important to have all of these ingredients ready before assembling the sandwich. First, get the biscuits in the oven. Then, whi le the pepper is roasting (see my tips on how to roast peppers), mix the parsley pesto if it's not already made. Now, once the biscuits are out of the oven then you can start the egg. Keep the pan on medium so you don't over cook or fry the egg, place a little butter in the pan and crack your eggs in. Top with a little salt and pepper. Keep your yolks runny even if you don't think you like runny eggs (start with over easy and work your way to sunny side up)- it's important for the sandwich. 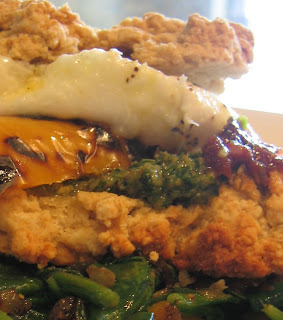 While the eggs are cooking, split open a biscuit, add a spoonful of parsley pesto and 1/2 of the roasted pepper. Now top with the runny egg and serve immediately with a fork. 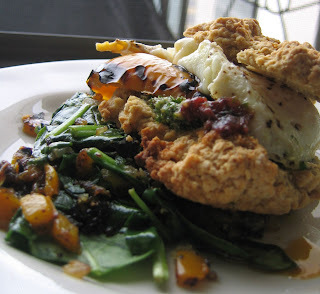 That is one outstanding biscuit egg sandwich.